Cytoreductive surgery and combination chemotherapy have improved 5 year survival for patients with ovarian cancer, but only 30% are cured due to detection at a late stage and the persistence of dormant, drug resistant cancer cells. Biomarkers could aid in early detection and in personalizing therapy to identify patients who would benefit from conventional or novel targeted drugs. Epithelial ovarian cancers are remarkably heterogeneous, differing in grade, histotype, invasiveness and proliferative index. Low grade Type I serous cancers are associated with mutations of Ras and Raf, but not p53, whereas high grade Type II serous ovarian cancers nearly all have p53 mutations, but rarely mutations of Ras or Raf. An effective screening strategy must detect both types of serous ovarian cancer, as well as the non-serous histotypes. CA125 is expressed by approximately 80% of ovarian cancers, but is elevated in serum at the time of conventional diagnosis in only 50-60% of patients with stage I lesions. 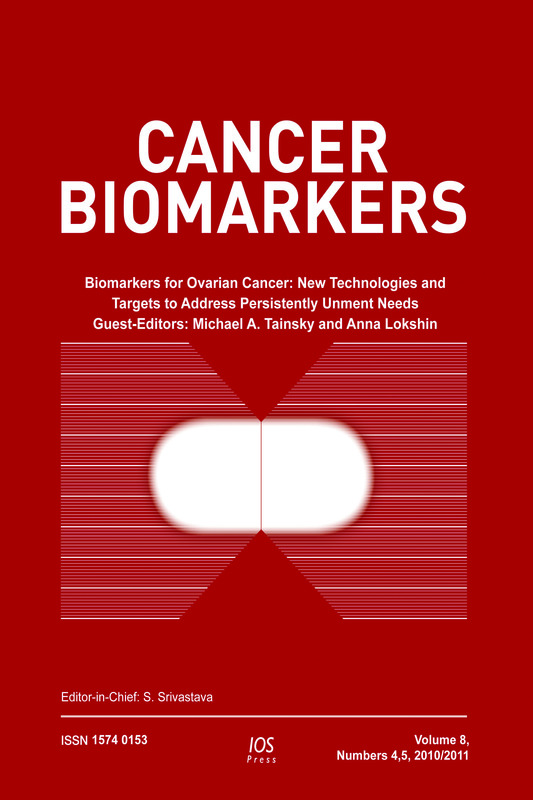 Papers appearing in this issue deal with several technologies and a variety of compounds that could provide serum biomarkers which complement or surpass CA125 for early detection. Among these are proteomic techniques, multiplex assays, antibody arrays, glycans, methylated promoters, miRNAs, and exosomes. Improved imaging strategies are also considered. To personalize therapy with conventional or targeted drugs, prognostic and predictive biomarkers can be used to match particular cancers with particular agents or modalities. Given the expense of anti-vascular therapy, biomarkers with a high negative predictive value would be particularly helpful. Potential biomarkers have been found in endothelial cells from ovarian cancers associated vessels.